Hi, this seems like a worthwhile project. We were just wondering, with regards to the budget, why are there different levels of pay grade for the field workers? Also, does the project take into account gender and cast equality when implementing the project, such as training the women or illiterate members of the community? From experience with implementing pump projects, training illiterate people within the community can often instill a great sense of worth for those who lack education. Hi Idriss, the service fee structure is based on the qualification, experience and the responsibilities each field worker is given. With the expansion of the project to other areas responsibilities of site selection, holding meetings with the government bodies and villagers and schools, construction work, monthly inspection of the new wells and sudden visits to the old wells for maintenance, and training is continuous. The more the villagers are visited and drilling of information about not using the arsenic contaminated well (apparently tubewell water tastes much better than piped or chlorinated water) and practice of proper personal hygiene the overall health uplift of the communities is possible. You are right about involving people from the community. 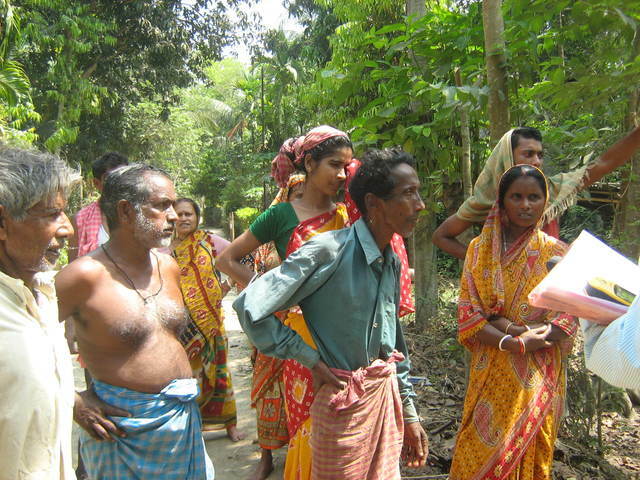 The paid field workers are all selected from the villages where dugwells are implemented except the awareness program manager and the project manager. And training is given to the person in the community who shows interest, common sense and has sense of responsibility. Today received the news over phone that the newly constructed wells in the new areas are working very well and people are eager to know more about the chlorination and they would take the responsibility of administering them. We are planning to have the bottled disinfectant being sold like shampoo and toothpaste from stores. The more number of bore-dugwells or borewells are constructed I think people will learn from their neighbors just like farmers learn about the farming practices from the local farmers meetings or from the media. Thank you very much for sharing your experience on this exchange. its a very good project but I want to know about the technology behind what you do, how you make sure the new dugwell doesn't contain Arsenic. what do you do with the old wells which are arsenic contaminated? Hi Kusum, the new dugwells are shallow that tap the water from the top, unconfined aquifer that contain little (below permissible limit) or no arsenic at all. Arsenic is tested once a year of all the dugwells. this is done routinely because in summer water level goes down and observations in the past has shown that with the decrease in water level arsenic concentration may go up so we make sure to monitor the well water during the summer months and the users are kept informed. The old wells are private that are used for other purposes like washing, bathing. People are informed repeatedly that they should not cook with the contaminated water for arsenic gets concentrated with boiling. The technology is simple. For the borewells instead of the regual small (2 inches) diameter borewell, 10 inches diameter pipes are used that are of 30 feet length and for the bore-dugwell, a dugwell of 3 feet diameter and 10 feet depth is excavated around a 20 feet length, of 10 inches diameter pvc pipe that is an insert within the dugwell. The bore-dugwell supply more water than the borewell. No matter water what, a lot depends on the availability of the water in the nearby water bodies like rivers and its tributaries seasonally. i think we should look forward for new technology from the univeristies or educational institute to find new ways for arsenic matigation. HPPI have worked on floride matigation in Rajasthan. This is a really interesting project. I like the community involvement and the donation of land. My question is about the chlorination of the wells. The proposal mentions that there are some problems getting the CBGs to purchase the chlorine. What are your reasons for encouraging chlorinating the source as opposed to point of use water treatment? You will not believe this. There are some communities who request the visiting field worker, who delivers the chlorine based theoline, not to apply the disinfectant because of the odor. Now we are taking a stand that a written letter will be given to each community stating that if anybody falls sick due to avoiding the application of theoline then the implementer will not be blamed. We do not encourage drinking the dugwell water without chlorination. Hence we do not believe that individual family would chlorinate their own water at the point of use until the concept of the importance of bacteria free water is instilled in them. 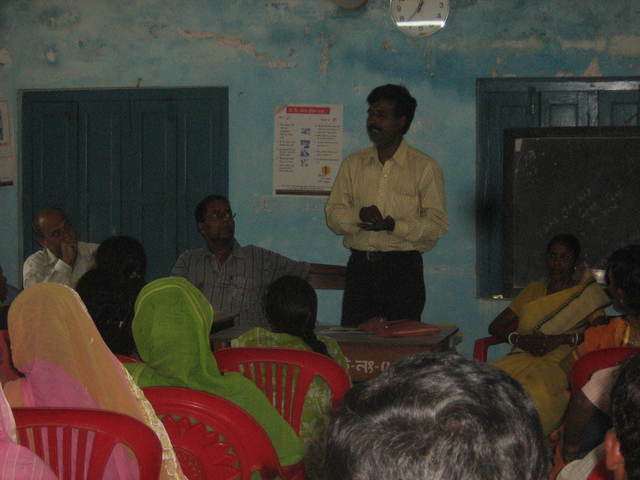 Repeated village meetings and awareness programs are ongoing including in schools. Our man power is small since we started from scratch as a pilot program hence the awareness programs are going a bit slow but we are determined to increase its pace. I think Claire and others are advocating other point-of-use filters. Point-of-use chlorination is not a good idea. BSF is an obvious choice, esp. since i feel that the matka filters to remove iron can easily be adapted to create the sand layers. Here is info on Anil Laul's design of the common man's traditional filter. It was proposed at the world water forum. Thanks Rajesh for the info of BSF. We will look into this system and may try a few pilot tests. This is a worthwhile project. Seems like you are trying to address the problem of chlorination although this is still a concern, maybe you could look into educating the communities on household treatment such as ceramic filters, SODIS or BSF which do not affect taste. As health is not always the best motivating factor, surveys or focus groups could be used to identify the best factors to use when promoting chlorine. Hope your project goes well. This Project Well proposal focuses on constructing modified borewells and dugwells along with public education. The proposal is very well planned with good monitoring and oversight procedures. It is clear that the project is much needed in the area that Project Well are working as knowledge of the dangers of drinking arsenic and bacteria contaminated water is limited. 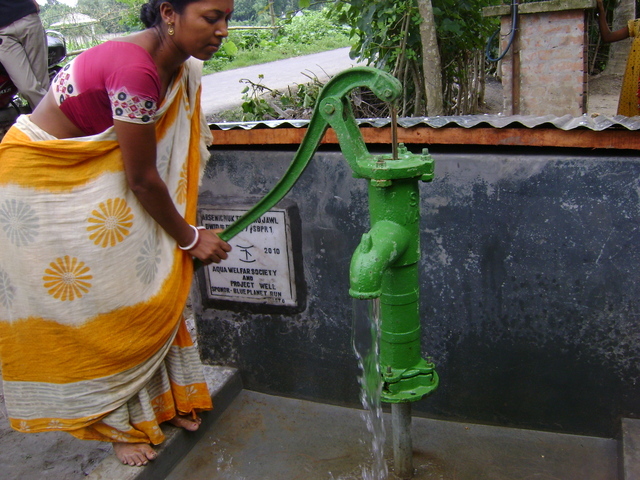 The public health meetings on the dangers of drinking arsenic contaminated water and related personal hygiene are crucial to the success of the program. There are several strengths of the proposal. Project Well have been able to demonstrate detailed tracking and program adjustment to date and this provides a good baseline of knowledge for future projects. The technology is appropriate for the specific arsenic problems that exist as they wells are rainwater fed. Project Well have made modifications to the technology based upon their implementation experience which should further increase its applicability. There is good community participation in the program through the donation of the site and the formation of the Community Based Groups (CBG). The issue of chlorination of the wells is certainly problematic as it has been shown that the local people do not like the taste and smell of chlorinated water. With this in mind, I would question whether chlorinating the wells is the most appropriate way of treating the drinking water. Perhaps boiling or filtration or some other point of use technology may be more readily accepted. The follow up testing and revisits to the well are regular and rigorous which should help identify any issues early and enable action to be taken quickly should it be necessary. There is a good local staff structure in place and Project Well have planned for a good economy of scale by sharing staff across a number of projects. Hope the momentum continues to increase and the work on increased acceptance and use across all the projects starts paying dividends.